As to the museum itself, it was recognised back in 1964 that there was a need for this type of museum. There were, however, no funds available. The need for the museum did remain on an agenda or two because in September 1988 the Organisation Committee for the War Memorial Museum was established. This committee oversaw the raising of funds and the construction of the museum. In December of 1988 the National Assembly passed the War Memorial Service Law and the War Memorial Service was established under Lee ByungHung. 1988 was, you’ll remember, the year of the Seoul Olympics and so many national cultural organisations received support from the government that year. Since 1988 projects undertaken have included building the museum, research into war history, research in cultural and artistic activities based on the theme of war which also heighten the reputation and honour of war veterans. The museum is located at the former Army HQ site and next door to the US Army’s Yongsan Post (actually, Korea is still a unified command so elements of ALL services of the US military are present in the Yongsan Garrison – I have particularly enjoyed the food and the beer at the Navy Club in Yongsan). The ground breaking ceremony for the museum occurred on 28 September 1990 with construction being completed in December 1993. It was opened to the public on 10 June 1994, so it is a reasonably new museum. I was living in the Itaewon area of Seoul (the foreign quarter) around this time and working in Incheon. I recall driving home to my apartment at about 21:00. There was nothing unusual around the museum at that time. At 08:00 the next morning, I drove past the museum again (in the other direction) heading towards Incheon. Now there was a B-52 bomber sitting in the front yard of the museum, fully assembled. Over about a 10-hour period it had been transported into the museum area and assembled. It still sits at the front of the museum. There are a number of exhibition areas in the museum with both regular static displays and special exhibitions being present. Over the past couple of years, the special exhibitions have included one on the Incas. This was replaced by one justifying (in Korean eyes at least) why the Sea of Japan should be renamed on all modern maps as the East Sea. That exhibition has since been replaced with one titled the “X-Files” (in July 2003), which looks at the Korean War with eyes 50 years on (this year being the 50th anniversary of the armistice). Other rooms include the Memorial Hall with busts of Korean national war heroes from the past – again, some of this is a bit patriotic but it is an interesting section never the less. Behind this Hall is an area of remembrance – best seen and experienced rather than described. Walking past there on the way to other history rooms takes you past a number of Neolithic and other prehistoric relics. The War History Room is one of my favourite areas and is actually a few rooms. It contains prehistoric relics, exhibits from Three Kingdoms Era (Koguryo, Paekche and Silla), Koryo Dynasty (the dynasty that gave Korea its name of Korea), Choson Dynasty, as well as armaments of modern times in foreign countries (generally those countries that had some contact with the Taehan Empire. There is also a section on the Japanese Colonial Period. The exhibition rooms mentioned above display most relic material with some reconstructions. Most of the artwork is modern. There are a couple of other main exhibition rooms. The Korean War Room has a good display of material and materiel from that conflict (naturally). The Armed Forces Room covers the establishment and development of the Republic of Korea Army, Navy and Airforce. There are a large number of models of modern equipment here as well as some interesting static displays, including parts of a naval vessel. The Expeditionary Forces Room has exhibits, displays, dioramas and photographs of Korean forces involvement outside Korea – specifically their involvement in Vietnam, Gulf War I and Peace Keeping Operations in Somalia. The Large Military Equipment Room has displays of military vehicles and aircraft – these carry on outside into the grounds of the Museum. On the outside of the building is an honour roll of all those who died in the defence of Korea during the Korean War and later. Some exhibits are or particular interest. The ones I particularly enjoyed were the half scale model of Admiral Lee’s (Yi SiSun) Turtle Ship. The Choson Artillery is a treat – especially the mortars. The early cannons firing a rocket like projectile are also interesting. There is a video running near them showing a reconstructed artillery piece firing these projectiles. The Multiple Launch Rocket System (Hwacha) from 1451 during King Munjong’s reign is of particular interest to Society members after articles in the recent Tiger and Kitten series on Korean weapons. I will send a separate article about this later. There are also some beautiful swords on display as well as guns of various sizes, bows, arrows, rockets, cannons, art works and models. I would think that any society member looking to kill a few hours in Seoul would have no trouble killing it at the War Memorial Museum. I would certainly recommend it for a days outing (or even a few hours if that is all you have to spare). 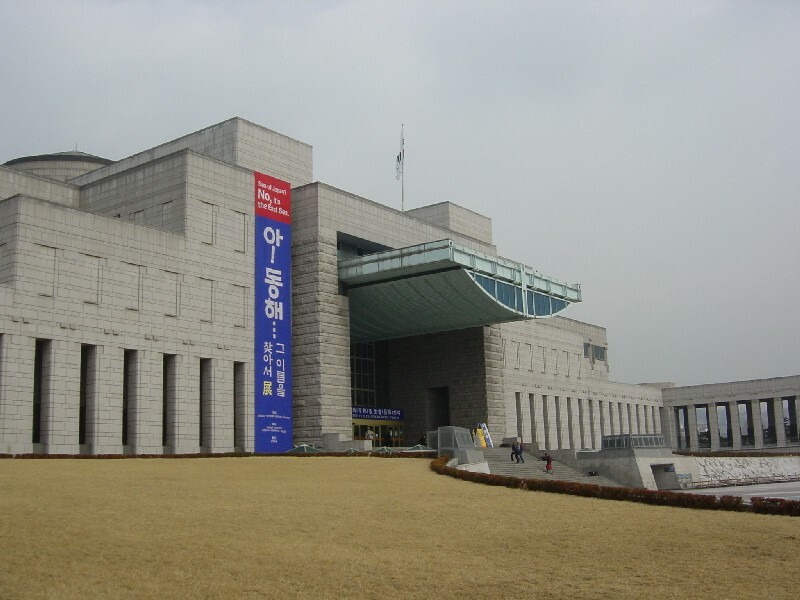 The museum maintains a website at http://warmemo.co.kr/ where you can obtain some information about it. The museum is open every day except Mondays (unless Mondays are a public holiday when the museum opens on the Monday and closes on the Tuesday). Admission is 3000 Won (about GBP1.60, USD3.50 or EUR2.40). If you are there in the summer, there is a pleasant area near the artillery pieces where you can sit outside in the shade eating hot noodles or similar. The museum is located at No 8, 1-Ga, Yongsan-dong, Yongsan-gu, Seoul, Korea. Mind you, if you say that to a taxi driver you could find yourself anywhere in Seoul. Better to take a taxi to the nearest subway station (or take the subway for that matter). The nearest subway station is Samgakchi-yok (Samgakchi station) on Line 6 and Line 4. For those of you who want an idea of what some of the exhibits look like, then I will include links to photos from the museum soon. All in all, a world class museum and recommended for a visit.